America’s Car-Mart is one of the largest retailers in the United States operating in the “buy here, pay here” segment of the used car market. Companies operating in this segment, also known as “integrated auto sales and finance”, sell older model used vehicles and provide financing to virtually all customers. The typical customer either has no credit or very poor credit and would find it very difficult to qualify for conventional automobile financing. Many customers do not have checking accounts and live paycheck-to-paycheck without recourse to emergency savings. The fact that half of Americans lack emergency savings, or a “rainy day” fund, can be hard to believe for those of us who have no direct experience with poverty. Most people without savings have jobs that either pay so little that they cannot save or they have poor financial management habits that prevent savings. Regardless of the cause, however, many of these people would not be able to hold down a job at all without reliable transportation. Big cities have many transportation options for people with limited financial resources but small cities, towns, and rural areas are car-centric cultures. Services like Uber either do not exist or are spotty, and traditional taxi services are not long-term solutions for commuting. Owning a car is simply a necessity in many parts of the United States. In this article, we take a closer look at Car-Mart by providing a brief overview, discussing the unique attributes of the business model, delving into the details of the financing operation, and considering the company’s prospects for continued growth. 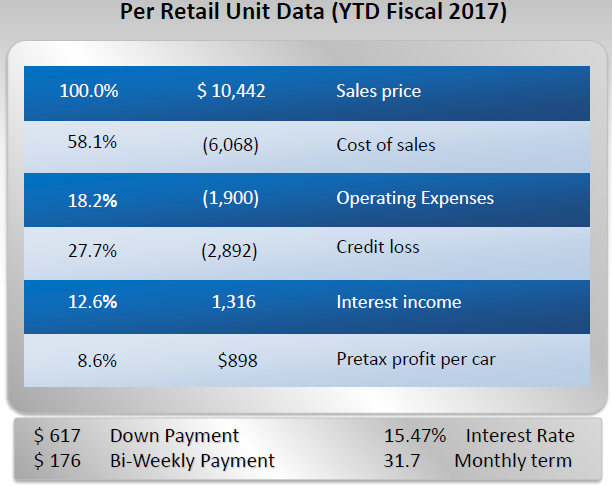 We recently discussed CarMax which is the largest used car retailer in the United States but tends to sell cars at price points that would not be affordable for poorer customers even if they could obtain financing. Car-Mart, in contrast, operates at a much smaller scale and sells older vehicles at lower prices. Car-Mart prefers to promote managers from within the company, although recent growth has also involved some outside hires. New managers handle a variety of tasks as a new dealership grows. A typical new dealership reaches profitability after the first year of operations. Established dealerships generate free cash flow that is returned to headquarters and reallocated either toward expansion or returning capital to shareholders. 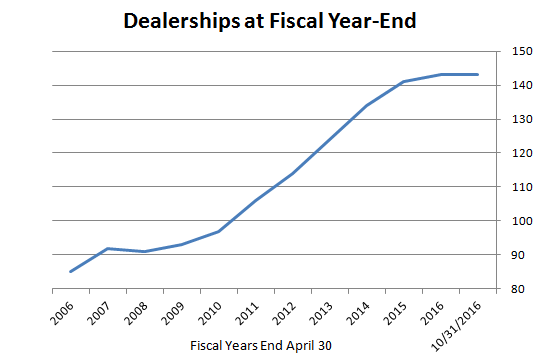 The growth of dealerships was quite rapid in the years immediately following the financial crisis, but has slowed recently. 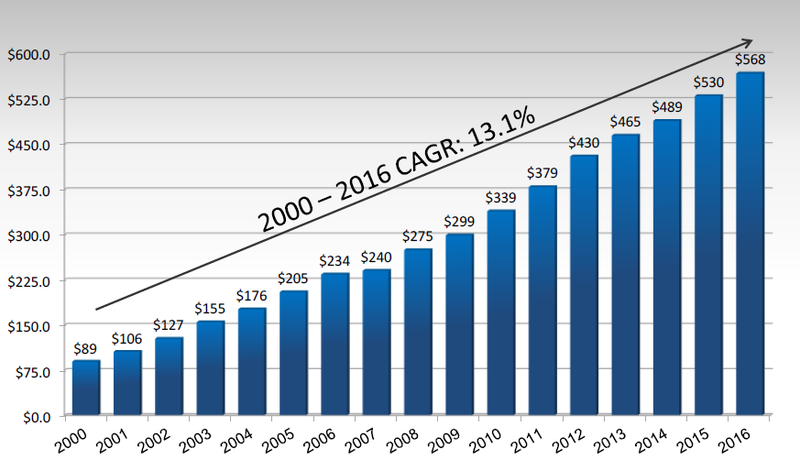 The vast majority of revenue is attributable to retail sales of used vehicles. The company also sells a small number of vehicles through wholesalers which is immaterial to the overall business. All vehicles are sold on an “as-is” basis. However, customers are offered a service contract which covers certain components. This is essentially a warranty purchased by the customer in exchange for service provided by third party service centers that Car-Mart has contracted with. The company also offers payment protection plans to customers who have used financing (which is nearly all customers). A payment protection plan obligates the company to cancel the remaining amount financed on a vehicle when it has been totaled or stolen. 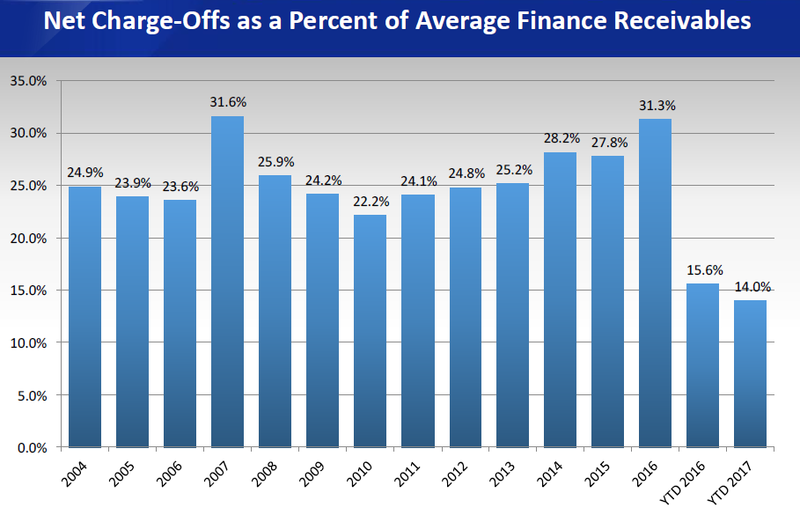 Gross margin has typically been in the low 40-percent range but has been pressured in recent years because of a general inflation in the value of used vehicles. Because Car-Mart’s typical used vehicle is between six and twelve years old, the effects of the collapse in automobile production during the recession is now being felt in a shortage of older used cars on the market. This has driven up the cost of acquiring vehicles and has pressured margins because Car-Mart’s customers cannot necessarily afford to pay more. The average retail sales price of a vehicle has increased from just under $7,500 in 2006 to nearly $10,500 in the first half of fiscal 2017. There are many elements of the “buy here, pay here” industry in general, and Car-Mart in particular, that are initially somewhat less than intuitive for those who do not have direct experience with poverty. Perhaps the most salient point is that the typical customer has very little disposable income and almost no savings. However, Car-Mart views all of these individuals as potential customers as long as they can provide proof of employment, a proposed budget, and personal referrals. Traditional credit scores are not relevant in this business because the customer will either have no credit or extremely poor credit. When one views the industry in this light, Car-Mart’s focus on small communities makes much more sense. Other than the lack of public transportation in such communities which makes automobiles non-discretionary, Car-Mart also gains numerous other benefits by close association with a community. If credit scores cannot be used to gauge credit worthiness, it helps to know people in the local community who can vouch for a potential borrower. If someone has held a job for a reasonable period of time, is active in the community, and has demonstrated good character, a dealer operating in a small town is likely to have the confidence to extend credit. On the other hand, word travels quickly in small towns and the grapevine can often reveal individuals who should not be trusted. The dealer will also develop a reputation fairly quickly in small communities and has an incentive to treat customers as fairly as possible. This can create a virtuous cycle where referrals make up a growing part of a dealership’s business. Car-Mart reports that a “large percentage” of business is from repeat customers and an additional ten to fifteen percent of sales results from referrals. One might wonder why repeat business would be high given that automobiles are lasting longer than in the past. The answer is that Car-Mart’s vehicles are much older than average with significant mileage already on the odometer. As we will see shortly, this requires shorter financing terms to ensure that a vehicle does not break down before the note is fully paid since most customers will simply stop paying their note if the vehicle is no longer running. At the same time, it is probably unrealistic to expect that a car purchased from Car-Mart will run reliably for many years after the customer pays off a loan. This creates a cycle of repeat business as vehicles need to be replaced fairly quickly. Customers are basically taking the last few “puffs” from a vehicle before it is no longer economical to maintain it. Many Car-Mart customers do not even have bank accounts and pay for all purchases with cash. Payments are usually made in person and in cash at Car-Mart dealerships on a weekly or bi-weekly basis. In an age of electronic payments, this might seem hard to believe for many readers but it is apparently not uncommon at all. 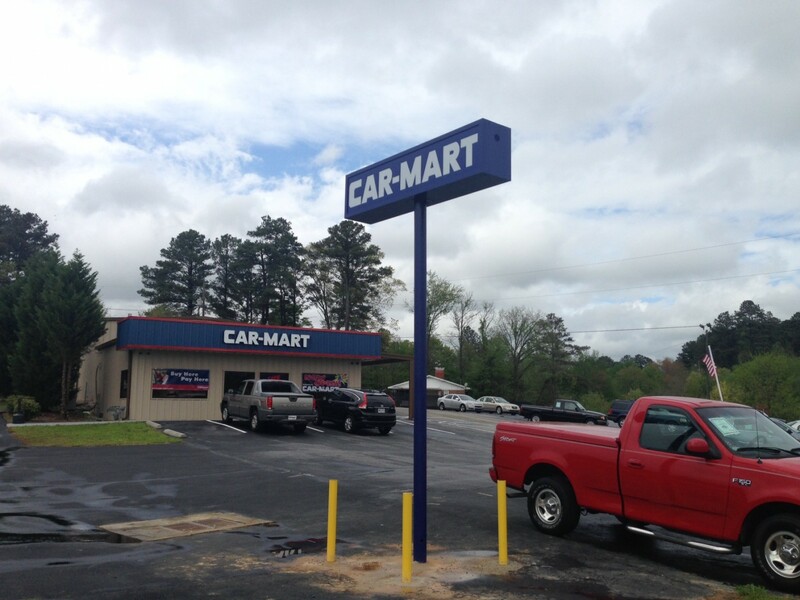 Car-Mart schedules payments to coincide with a customer’s pay day and offers free check cashing service in dealerships to encourage customers to make payments on their note as a first priority after receiving their pay. Most investors will not be able to personally relate to the economic issues facing the typical Car-Mart customer but it is important to gain an understanding of some of the unique aspects of serving low-income customers, especially as we delve into the financing business in more detail. When one looks at core competencies for a retailer, it is normal to focus on attributes such as sourcing inventory, advertising and attracting customers, providing a compelling product, and having the skills needed to close a deal. While these are all important skills for a Car-Mart dealer, by far the most important aspect of the business involves servicing and collecting loans. When you are in a business where you know, in advance, that your customer base is very likely to default, this expectation must be built into your overall business model in terms of pricing and strategy. As of October 31, 2016, the allowance for credit losses of $111.3 million was approximately 23.5 percent of the principal balance of $474.3 million. 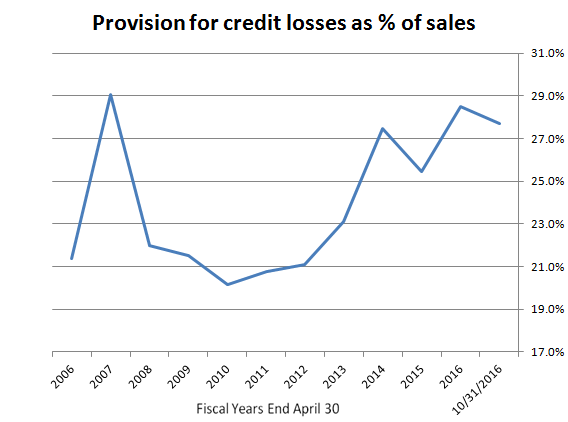 How does Car-Mart mitigate the fact that many of the loans it originates will fail to perform? First, the company targets gross margins on vehicles that are substantially higher than auto dealers selling to a more creditworthy market. Perhaps counter intuitively, the higher sticker price on the vehicle may not, by itself, dissuade customers because what they care most about is the affordability of the weekly or bi-weekly payment, not the sticker price on the vehicle. Second, the fixed interest rate charged on all loans is relatively high at 16.5 percent. This is obviously far higher than the interest rates available to credit-worthy customers and mitigates some of the risk of default. Third, loan terms are far shorter than one might expect. The average originating contract term during the first half of fiscal 2017 was 29.2 months while the weighted average contract term of all receivables was 31.7 months. Finally, the company specializes in efficient collection by encouraging customers to pay in person on their payday. By getting “first crack” at the customer’s paycheck, the risk of loss is lower than if other obligations are paid first. Obviously, these figures are averages and accounts for typical credit losses across the entire loan portfolio. We can see that a good repeat customer who pays on time is highly profitable for Car-Mart which is why repeat and referral business is so valuable. Obviously, defaults are going to occur but the combination of the gross margin and high interest rates make the overall portfolio yield acceptable results. Collection efforts are very important both from the perspective of keeping credit losses down and ensuring ongoing customer satisfaction and a good reputation in the community. Within a couple days of a missed payment, Car-Mart’s local staff will contact the customer by phone and mail to determine why the payment was missed and how the account can be made current. The company does not generally make loan modifications except to extend the time of a loan when management believes that doing so will increase the total amount collected from the customer. Repossession of vehicles is either handled by management or contracted out to a repossession specialist. GPS units have been placed in vehicles to make repossession more likely. However, repossession is a last resort because the recovery on a repossessed vehicle is typically not sufficient to cover the outstanding loan amount and obviously taking away a customer’s car can involve reputational harm for the dealership. 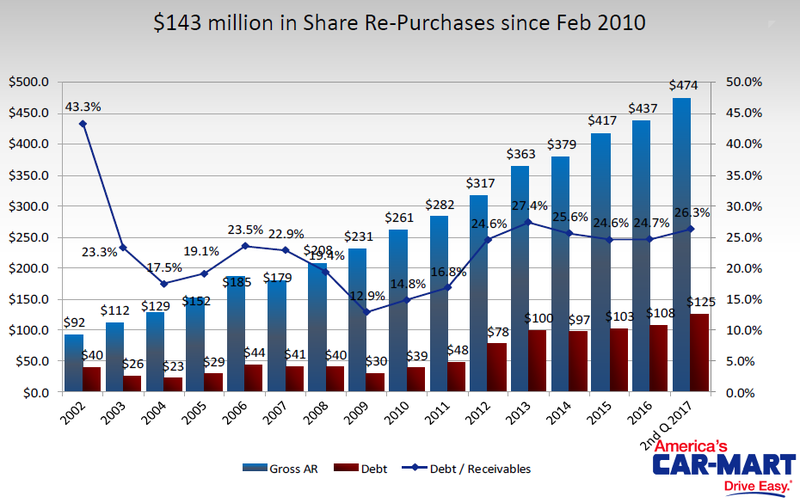 It should be apparent by now that the company does not securitize its receivables. Loans are retained on the company’s balance sheet and funded with a combination of shareholders’ equity and a revolving credit facility. As of October 31, 2016, the company’s debt-to-equity ratio was 53.1 percent with total debt of $124.7 million against net finance receivables of $363 million. Shareholders’ equity was $234.9 million. 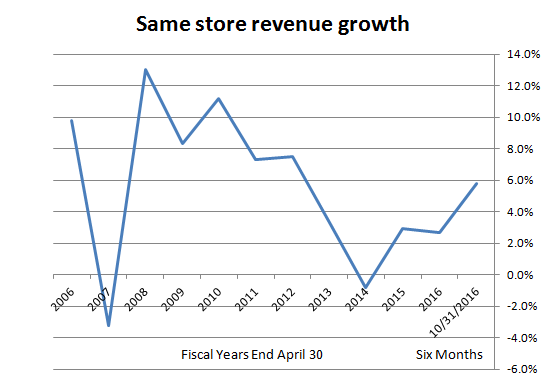 The data shown above demonstrate that the company weathered the recession quite well. Although one might think that charge-offs would skyrocket in difficult economic times, it appears that the Car-Mart business model is resilient during tough economic times. This is probably due to the fact that customers are perpetually strapped economically and their disposable income does not really vary with economic cycles (assuming, of course, that they retain their jobs). Furthermore, for those who do have jobs, keeping their car is even more critical during difficult economic times because it is necessary to get to work. A large pool of unemployed people ready and willing to take any job during a recession likely makes people who do have jobs feel less secure and even more averse than usual to missing work due to unreliable transportation. As we could see from the first exhibit in this article, management believes that there are ample locations available for future growth. There are many small towns within the company’s historical regional base of operations that could support a new dealership. With a start-up dealership requiring only $1.5 to 2.5 million in initial capital, the company could afford to expand much more rapidly based on internally generated cash flow. If unit economics of each incremental dealership could be brought up to the company’s average in short order, this would appear to be a good use of capital. From management’s conference calls and actions, it seems like there is a great deal of conservatism when it comes to the rate of expansion as well as the decision to restrain growth to within the company’s historical region of the central southern states. How scalable is the company’s business model and what are the constraints that would prevent a nationwide rollout of the Car-Mart concept? The United States is obviously full of small cities and the underlying economics are likely to be quite similar. Management may not feel that they have enough local knowledge to operate effectively except in their existing region and is moving beyond it carefully. Car-Mart operates in a very difficult market. The company’s customers are people who have very little disposable income and are perpetually strapped for cash. Such customers inevitably will default on their obligations at a rate far higher than more credit-worthy customers. In order to successfully operate in such an industry, management must strike the right balance between pricing of vehicles, financing options, and collections of delinquent accounts. A merciless approach will earn the company poor reviews while a softer than justified approach ruin the economics of the business. Despite initial qualms regarding the business model, it does not appear to be “predatory” in the sense that it operates in a free market system in which customers do have alternate choices. One may obviously purchase a used vehicle from a private party or a huge number of “mom and pop” dealerships. Car-Mart offers customers convenience that is obviously appealing and the growth it has experienced validates the overall model. Recent results have been pressured by a combination of higher prices for used vehicles which has pressured gross margin, more aggressive financing options provided by other players in the sub-prime auto market, and elevated credit losses compared to typical experience earlier in the decade. As the inventory of used vehicles in the six to twelve year old range increases over the next several years (due to recovering new car production after the recession), the price of used vehicles is likely to decline which should lead to a recovery in gross margins. Aggressive financing options by competitors could abate due to higher short term interest rates. Recent installation of GPS units in vehicles could improve customer payment compliance and aid in repossession of vehicles, thereby trimming credit losses. At a recent market capitalization of approximately $340 million, Car-Mart trades at approximately 145 percent of book value and about 14 times earnings. Share price weakness in late 2015 and early 2016 was clearly due to the headwinds described above and the stock has recovered significantly since then. However, the current quotation could still be an attractive entry point for long term investors who believe that the potential headwinds are transitory in nature and likely to abate in the coming years. If management figures out a way to accelerate growth and take the concept nationwide, returns to shareholders are likely to be very attractive. Update on February 2, 2016: The Rational Walk published an article on analyzing proxy statements using Car-Mart as an example. Readers interested in the company might want to review this post for more insight into the company’s corporate governance. Disclosure: No position in America’s Car-Mart. 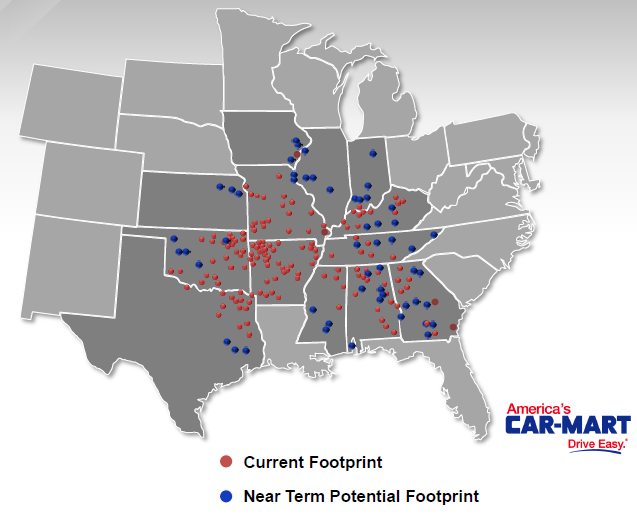 ← CarMax: A Better Way to Buy and Sell Used Cars?